Young men’s style today is all about the layering trend. 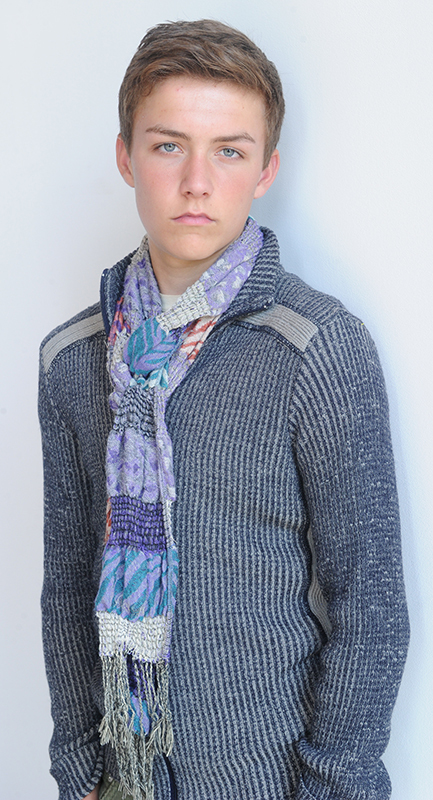 Our teenage model Robert is a perfect example. We’ve combined all the elements of texture, pattern, and color in one fashionable look! First off we started with putty color corduroy slacks from Land’s End. These pants are casual as well as season-less, and the color can work as a backdrop for just about any other color. It’s a nice change from the more typical blue jeans, or brown, gray, and black slacks. A graphic print t-shirt featuring Marvel comic characters was a great trendy discovery as it creates a nice counterpoint to the textured cardigan sweater from Cignal. Look for items that have some great detail like the epaulet at the shoulder of this sweater. What really makes this look stand up and stand out is the ethnic inspired, multicolor scarf. A scarf like this creates a European feel, and is always a solid fashion statement. Like all young men, Robert has an amazing collection of sneakers, so we used his own piped-in turquoise Nikes to finish off the look. There is no doubt about it, layering is a fantastic way to make the most of your clothing budget while looking like a million bucks like our model! With the holidays in just a few weeks, our youthful model Charley illustrates just how to do “dress up” the right way. You can’t do any better than velvet to stay stylish and warm when the weather takes a temperature dip. It feels luxurious, and the modern synthetic blends of this fabric are machine washable, which is great for kids on the go during this time of year! This red velvet dress with attached cardigan from Jenny Annie was a terrific find at Goodwill. The color is quite seasonal, but not garish. To make the look party ready I chose a beaded headband with a black flower on it that echoed the floral trim on the dress itself, as just one of the glamorous accessories. But, because she’s quite a stylish girl in her own right, Charley had her own ideas on adding other elements to her festive fashion look. She chose a large sparkly faux diamond ring, and a purple satin purse! Her mom loved that she could use the black flats that were already in Charley’s closet to finish it all off. Sometimes just one spectacular piece like the velvet dress is all you need help make the season as bright as our model!